When planning your next vacation, you have a lot of options available to you and a lot of different tools and websites in order to plan the perfect trip and get the best deals and discounts. For a vacation that offers relaxation, exploration, and luxury all in one great package, consider booking a cruise with Travelocity. Not only do cruises stop off at multiple destinations, allowing passengers to see and experience lots of different sites and activities, they also come with a long list of additional advantages. For instance, modern cruise liners are fitted with a long list of amenities and services to rival the finest 5-star resorts and hotels. You’ll be able to find everything on board your cruise ship, from fine dining restaurants to full spa treatments and more. Booking a cruise can seem quite overwhelming at first, with a long list of potential departure points, durations, destinations, and prices. That’s why it’s a smart idea to use a site like Travelocity. This online American travel agency, owned and operated by Expedia, is one of the leading names in the vacation business. Travelocity makes it easy to book a cruise, or any other kind of getaway, offering low price guarantees and lots of additional services to ensure that every traveler feels fully satisfied every step of the way. By using Travelocity to book your cruise, you’ll save time and money, and there’s a long list of destinations and cruise themes to choose from. Booking a cruise with Travelocity is pleasantly simple and straightforward. Searching for a cruise on the internet can be a highly time-consuming process, involving lots of different sites and fare aggregators, but Travelocity keeps things simple and lets you find the right cruise and the best price in a matter of minutes, saving you a lot of time and some cash too. Searching for a cruise on Travelocity is very simple: all you need to do is choose your dream destination and the month in which you'd like to travel. From there, Travelocity will take care of the rest, scanning for the best prices from all of the leading cruise line operators like Norwegian, Disney, Carnival, Royal Caribbean, Holland America, MSC, Oceania, Princess, Crystal, Celebrity, and more. Once you've got your list of search results, you can narrow them down with additional filters or arrange the results by price, length, date, and more. All of these easy-to-use features make it exceptionally easy to find the right cruise for you with Travelocity. What's more, Travelocity also provides a full Price Match Guarantee, refunding the difference on any cheaper-priced cruise you can find within 24 hours of your booking. The site also offers round the clock customer support and a full post-booking service to ensure that help is always on hand and you can enjoy every step of your trip without any issues. In terms of options, Travelocity really stands out as one of the broadest and most in-depth cruise finders on the internet right now. 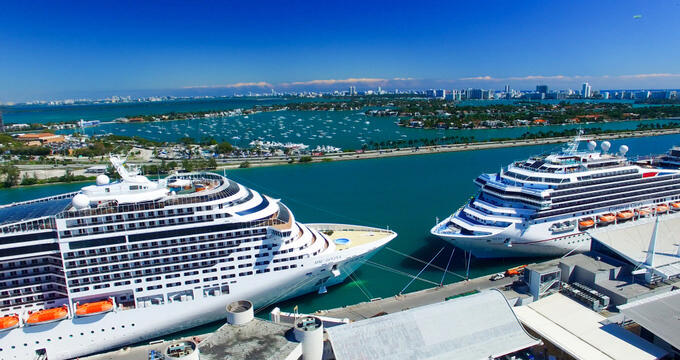 In a matter of seconds, you can find your dream cruise vacation and the list of potential destinations is almost endless, including all the popular classics like the Caribbean, Hawaii, Cuba, the Bahamas, and Mexico, as well as many other locations around the world including Europe, Africa, the Middle East, Australia, Asia, the Galapagos Islands, Central America, and South America. World cruises and transatlantic cruises can also be booked through Travelocity and the site's lowest price guarantee ensures you'll always be getting the best value cruises and hottest deals no matter when you choose to book. You'll also be getting to choose from all of the big cruise lines from around the world, with names like Carnival, Celebrity, Princess, MSC, Cunard, Crystal, Costa, and Royal Caribbean, standing out as some of the best.